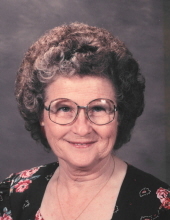 Memorial services for Doris Faye Burnett 88, of Athens have been scheduled for 2:00 P.M. Sunday April 14, 2019 at Living for the Brand Cowboy Church with Bill Nowell officiating. Private family burial will be held Monday. Faye passed away Thursday April 11, 2019 in Athens. She was born September 6, 1930 in Henderson County to the late Andrew Joseph and Nora Lavonia Lawrence Gartman. Faye grew up in the Bethel Community of Henderson County. She married Forace Burnett at age 14 and moved to Camp Chemical in Velasco, Texas, now known as Freeport, for Forace’s job at Dow Chemical. They lived in Velasco Heights and raised their family. At retirement, they returned to the Bethel Community in 1980. Ms. Faye and Pawpaw served in the children’s ministry at First Baptist Church in Athens. Ms. Faye also enjoyed working with all the children who attended Mother’s Day Out program at First Presbyterian Church in Athens. Ms. Faye and Pawpaw cared for many children in their home sharing their love of the country. Obviously, she LOVED children and numerous children called her “Grandma or Ms. Faye” as she was a foster parent to numerous children. Pawpaw raised a garden and big crop’s of watermelons and Ms. Faye enjoyed taking truckloads of watermelons and selling them everywhere. Faye was the youngest of 14 siblings and was the historian of the family. She enjoyed bringing all the family together. Faye was preceded in death by her husband of 52 yrs. Forace Dwain Burnett, second husband of 7 yrs. Donald Paxton, grandson Billy Dwain Nowell and 13 older siblings. Survivors include her daughters Lavonia Nowell and husband Bill, Glenda Thompson, Brenda Tarter and husband John, Alice Burnett. Grandchildren, Michael Nowell and wife Jill, Shauna Nowell Brewer and husband Brett, Rusty Abney and wife Brandy, Wendy Forester, Page Tutle and husband Tim, Joanna Proctor and husband Kevin, Sabrina Burnam and husband Brian, Alisa Monroe and husband Josh, Forrest Attaway and wife Amy, Travis Attaway and wife Carrie, 10 great grandson’s and 9 great granddaughters and one great great grandson. The family will have a visitation after the service on Sunday at the church. In lieu of flowers , donations can be made to the Children’s Ministry at the Living for the Brand Cowboy Church in Athens, Texas P.O. Box 2178, Athens, Texas 75751. Arrangements by Autry's Carroll-Lehr Funeral Home. "Email Address" would like to share the life celebration of Faye Burnett. Click on the "link" to go to share a favorite memory or leave a condolence message for the family.